Finding free internet at the end of an ethernet cable is like winning a dollar in the lottery. You know you should be happy, but it's more of an inconvenience than anything. However, with D-Link's new AC750 compact wireless router, you can turn that tethered internet lemon into delicious wireless lemonade, and it even lets you share files on a USB drive with any computer in range. 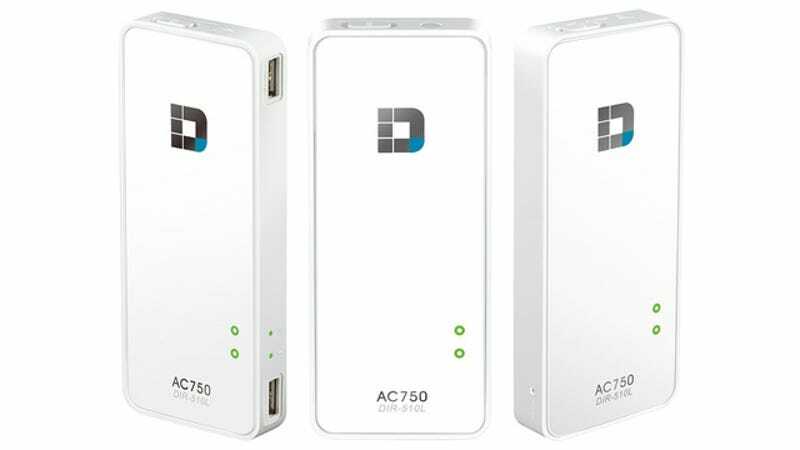 D-Link claims the Wi-Fi AC750 is actually the world's first portable 802.11AC router that can also charge your hardware thanks to a 4,000mAh battery inside—which of course is needed to keep the AC750 functioning. But we'll still denote that feature as a plus. The router can be fed an internet connection either from an ethernet cable, or from a portable cellular modem attached to one the AC750's dual USB ports. Those ports also accept USB flash drives and external storage for streaming media content to various devices, while a built-in DNLA server also lets you send movies or music to a TV or console.